All 17 Sperry coupons have been verified and tested today! If you want a $10 Sperry promo code to use on your $50+ purchase right away then all you need to do is sign up to receive emails from Sperry. To sign up all you need to do is visit the Sperry homepage. Scroll down to the middle of the page until it says “Join Our Crew. Enter your email address in the grey text box and click the arrow. Once you do this the coupon should arrive in your email soon. In order to score free shipping at Sperry, all you need to do is make sure your order adds up to more than $25 and it will be sent straight to your door. If you are lucky you can score a Sperry code for free express shipping, just keep checking this page for one. Sperry wants to make sure you are 100% happy and satisfied with your purchase. So if your new shoes arrive and you are not happy just attach the prepaid shipping label to the box and ship it back to Sperry free of charge. Those savvy shoppers should always check the outlet before they purchase a full price item. You can find all your favorite shoes as well as men, women, and kids clothing + accessories. Us here at CNN Coupons have seen savings up to 50% off full price! If you want to save a little extra on your next Sperry purchase without a Sperry coupon code then all you have to do is refer a friend. To refer a friend at first you need to have a pre-existing Sperry account. Log into your account and navigate to the bottom of the Sperry homepage. Find “Refer a Friend” and click on it. Enter the email address of whoever you want to refer and click submit. 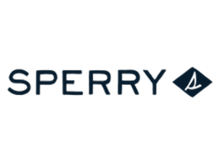 They will receive a $20 off Sperry discount code into their inbox and once they make a purchase of over $75 you will also receive a $20 off Sperry promo code in your inbox. Sometimes there just isn’t a Sperry coupon code around to get the savings you want on a brand new pair of shoes. But if you exercise a little patience you can save huge on your next Sperry purchase without blinking. There are two big sales throughout the year. The first is the Semi-Annual Sale that takes place in the middle of the summer as well as during the holiday season. During this sale, Sperry shoppers can find items up to 50% off all without a Sperry promo code. Another sale that happens at Sperry is the Customer Appreciation sale where you can get 30% off site-wide. The dates of this sale change every year so the one way to make sure you are in the know about the sale is to sign up for the email list at Sperry or keep coming back to this page at CNN Coupons. Sperry Crew members are always in the loop when it comes to Sperry coupons once you join the list all the coupons plus all other sale notifications will be sent straight to your email. Beyond this, you will also get free express shipping on all orders over $50 as well as an entry in for a free pair of Sperry’s every month.